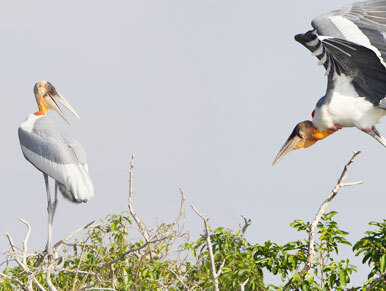 The bird sanctuary at the Prek Toal core area of the Tonle Sap Biosphere Reserve has been called “the single most important breeding ground in Southeast Asia for globally threatened large waterbirds.” The Biosphere covers 31,282 hectares at the northwest tip of the Tonle Sap Lake and plays host to species including Greater and Lesser Adjuncts, Black-headed Ibis, Painted Stork, Milky Stork, Spot-billed Pelican, Grey-Headed Fish Eagle and many more species. 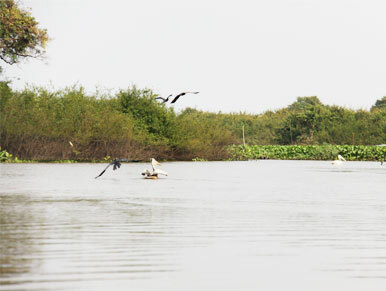 Of the three Biosphere core areas on the Tonle Sap Lake, Prek Toal is the most accessible from Siem Reap and the most popular with birdwatchers. 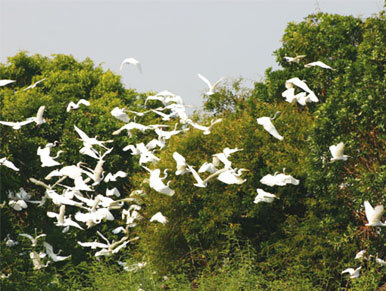 The best time of year for viewing is the dry season when flocks of migratory birds congregate at Prek Toal. As the dry season progresses and the water recedes, the number of birds increases but the travel to some of the more important viewing areas becomes more difficult. Prek Toal is a magnificent floating village. It is from the village that we has access to Prek Toal’s bird sanctuary which can be made only by boat from Siem Reap or Battambang. About 2 hours by boat to arrive at Prek Toal, and departure by any small boats with oar inside the sanctuary. Birds are few and some very big birds, such as pelicans, Big Marabouts, storks, made their nest on the big trees, according to the season.